Two of Namco Bandai's most popular franchises enter the third dimension. It should go without saying that whenever a company releases a new piece of hardware, a classic Namco Bandai compilation is sure to follow. Case in point, the Nintendo 3DS. The system just arrived, and Namco Bandai is hard at work on Pac-Man & Galaga Dimensions, a strange yet intriguing mix of games that merge old school arcade fun with more modern day and experimental offerings, all wrapped within a tiny cart. We're intrigued, to say the least. The first games that jump out are Pac-Man Tilt and Galaga 3D Impact, both of which represent the newest entries for both franchises. The former is a side scrolling platform adventure, as you guide Pac-Man (with arms and legs, by the way) through multiple neon worlds with a pinball inspired theme. As such, expect to bounce him off bumpers and propel the yellow guy via flippers, collecting power pellets along the way. In addition, you'll watch as he spins around loops (ala Sonic the Hedgehog) and hitches a ride on a raft. Thing is, you don't play Pac-Man Tilt with the 3DS on your lap. Instead, you physically maneuver the device to "tilt" the environments. 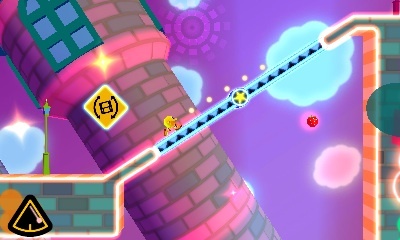 In one instance, tilting the handheld to the right results in a bomb rolling into a brick wall and subsequently destroying it, allowing Pac-Man to keep moving. Then we have Galaga 3D Impact. 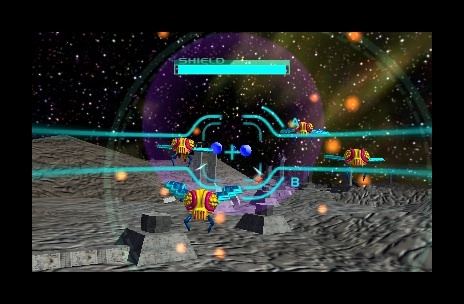 This on-rails shooter lets you play a version of the hit arcade game from a first person perspective. Like Tilt, it also uses the 3DS' gyroscope, but with this game, you use it to aim the crosshairs to blast pesky alien bugs. Now if those games don't interest you, Namco Bandai has some others that may justify a purchase. You'll have the original Pac-Man and Galaga, complete with multiple arcade cabinets to choose from. On top of that, you can expect the critically acclaimed Xbox Live hits, Pac-Man Championship Edition (but not the superior DX version, oddly enough) and Galaga Legions. At this point, we're not sure what to make of Pac-Man & Galaga Dimensions. On the one hand, those aforementioned Xbox Live titles make the package appealing, but the newer games look iffy, especially Galaga 3D Impact. That said, Namco Bandai has yet to announce an official U.S. release date, so we'll wait to get our hands on this promising title before passing judgment.